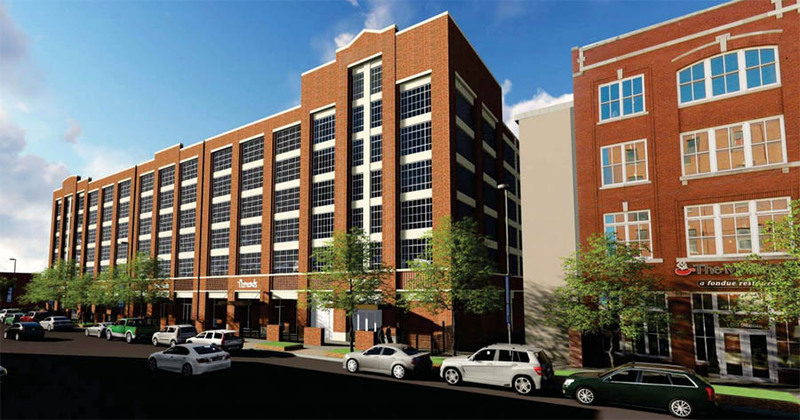 The southwest corner of Oklahoma and Sheridan, one of the key intersections in Bricktown and one of the largest of the remaining surface parking lots, is set to be developed as a 7-story parking structure with retail on the ground level. The property is owned by Don Karchmer, who also owns 4 E. Sheridan to the immediate west. That property contains the Melting Pot restaurant and the upper floors were recent remodeled then occupied by construction company J.E. Dunn. 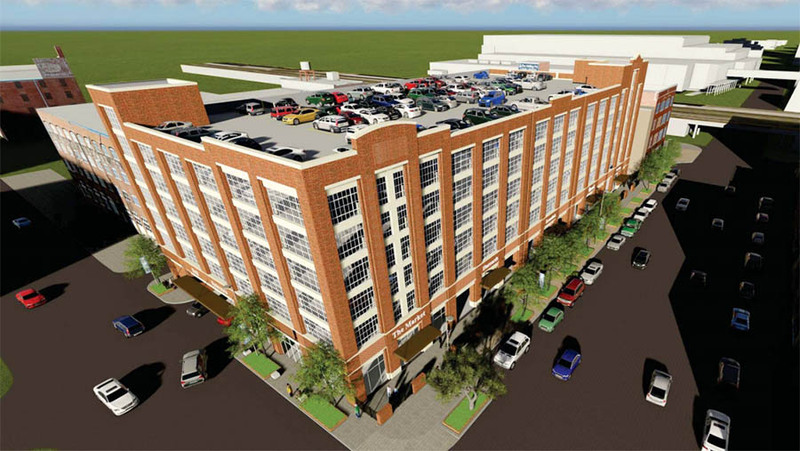 To the east of the proposed garage was to be a 9-story Canopy Hotel but the developers lost the franchise to the new owners of the former Bodyworks site in East Bricktown, but are actively working on getting another hotel flag for their site. 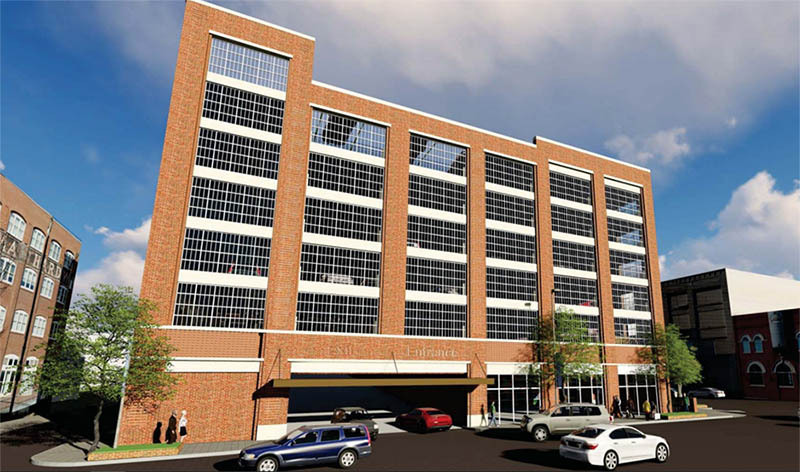 This new project would be 240,000 square feet, with 16,000 square feet of retail / commercial space, one underground parking level and 6 more above ground. Architects are ADG of Oklahoma City. Wow! This is how you build parking. Doesn't even look like a garage. Could this be a location for a downtown grocer or at least a CVS? If their concern is parking, they will have it being connected to this garage. Awesome! I hope it's built a little better than the one that's down there now. It's so tiny and I'd imagine Oklahoman's large trucks and SUVs are hard to maneuver in there! These renditions look fantastic. 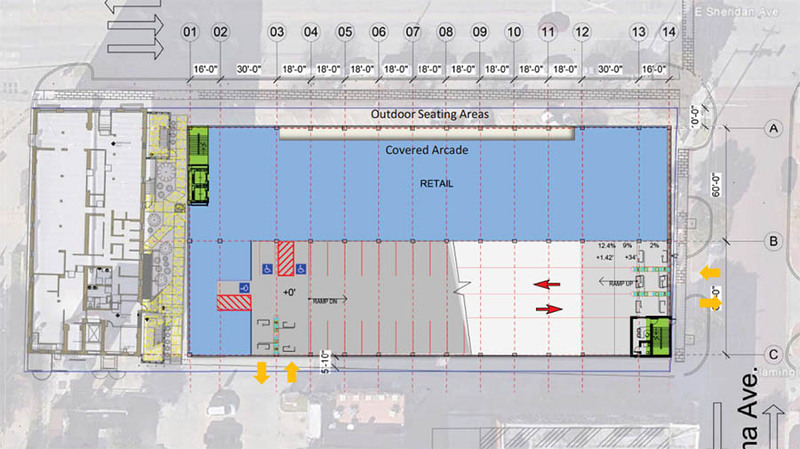 What an improvement; retail on the bottom floor and structured parking that looks like it fits in Bricktown. Oh, now that is lovely. Very impressive! Kudos to Don. Will go a very long ways towards making Sheridan feel even more urban. Once the hotel goes on on the SE corner of this intersection and once the Steelyard, the two related hotels, Criterion and Springhill Suites all finish, Sheridan is going to be very, very impressive, all the way to Lincoln. What does the timeline look like for this, and is there anything happening that might block it? Any chance they'll be waiting on a flag for the site to the east before proceeding? 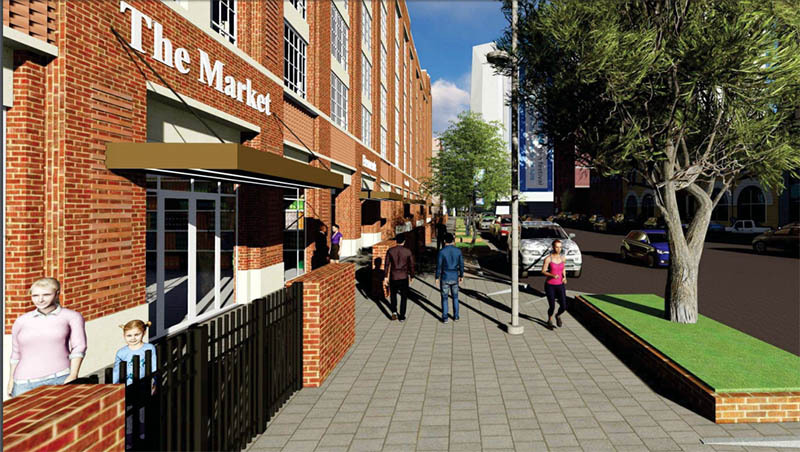 They have submitted to the Bricktown Urban Design Committee for feedback. This has been planned for a while and I knew it would be going forward soon. Don't see any reason why the design committee would have major issues and whatever the relationship with the hotel across the street, the garage would obviously have to come first. I think this could move forward pretty quickly. This is absolutely a home run. Like bchris, my immediate thought was "Now this is how it's done!" I can't believe I'm excited about a parking garage but this just looks fantastic, and will provide much needed parking for upper Bricktown. Structure looks good. I am not sure how I feel about the "outdoor seating areas" having brick columns and iron fencing. It looks to be the same style as the one that is currently around this parking lot and it is very uninviting. Would much rather see full sidewalk connection, with smaller planter boxes - or the planters completely eliminated. This sidewalk is and will be heavily used and needs to be as wide as possible - especially with the metered parking directly next to it. Pete - what is the holdup on the hotel flag/development of the lot just east of this proposed garage? Also, this reminds me to ask about the Journal Record garage? What's the latest on that garage? My understanding is they thought they had a deal with Canopy but then the Bodyworks group (Mazaheri) swooped in and got it instead. Now, I understand they are close to getting another flag and once again moving forward. As far as the Journal Record, the entire project has been very slow moving but there has been positive momentum... Most recently, the City approve TIF incentives. As a side benefit, maybe this will finally force Chilenos to put more emphasis on the canal facing side of their restaurant. It's almost like they forget that they have a three story facade fronting the canal. Throwing a 7-story garage up in front of their primary entrance and limiting visibility from Sheridan should force some change. Excellent point. Hopefully it's successful in forcing more canal side focus. Hope so. It just seems like they are missing a massively profitable three story patio bar opportunity back there. Throw in the Cummins proposal and Bricktown is looking mighty fine! Bricktown and Deep Deuce are steamrolling ahead. With massing about to happen west of downtown along Main and over to Sheridan, OKC downtown will be hugely extended vs. 10 years ago. Now, as MidTown fills in, this will be a real downtown. Yep. And if we could somehow get the Spaghetti Warehouse building's upper floors reactivated, we'd really be in business. Looks nice! Can't really tell that it's a parking garage, which reminds me of SMU's parking garages in University Park, TX. Now just get quality infill on the giant parking lots in front of the Bricktown Events Center, the UHaul building, and Bass Pro. 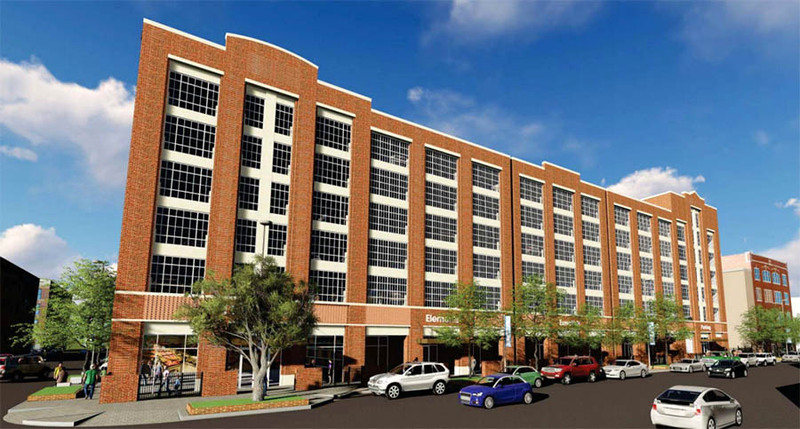 Well, if OKC needs anything in its downtown, it's another parking garage. So this one, coupled Karchmer and Journal Record will add 3 more. Wow. Parking garage on the streetcar route is good. This looks good. And as noted by Rover, it's good along the streetcar route. This is one of the benefits of the streetcar. During high demand times in one district, lower demand in another can balance out parking. For example, a large event in Midtown can use Bricktown parking when the streetcar is up and running.